Mmmm Strawberries. Sounds sweet. Are you with us? Of course you are! You're all about the delicious berry as a treat, and fact of the matter is, you probably know someone else who is in a big way, too. We're talking about your kiddo here! Yussss, this is gonna be great. Let's get them suited up for Strawberry Season! 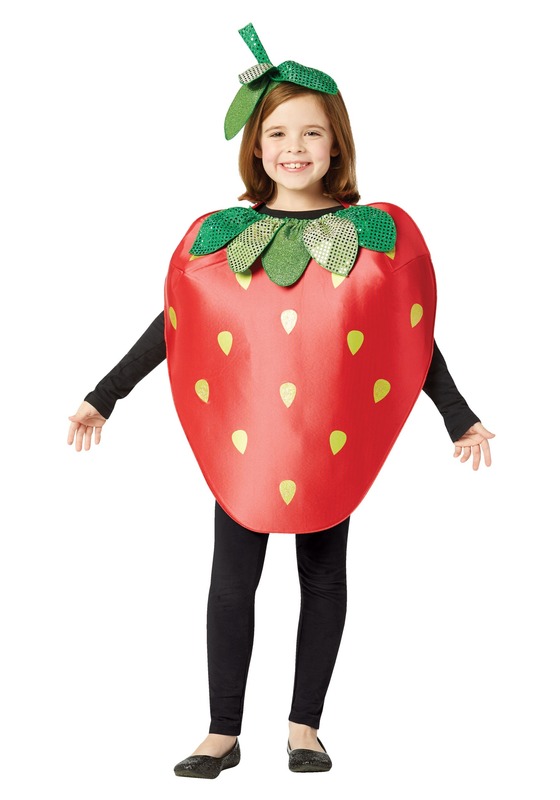 They'll have no trouble becoming the sweetest, most excellent berry of them all when you pick up this Kid's Strawberry Costume. We take all the hassle out of transforming your kid into a strawberry, too, because we're your one-stop costume shop! Pick them up a black jumpsuit (or have them wear their own clothes) and they'll be ready for the sweetness. That what we're all about, after all. HalloweenCostumes.com is here to make sure your costume experience is top notch... and that covers every member of the family you're shopping for! Costume style is pretty easy when we're talking about our fruit groups. In the case of this Strawberry costume for kids, all we're talking about is a tunic! Well, a tunic top along with a headpiece, that is. With printed seeds and sequined leaves, this costume has everything needed for the food groups play, or for some trick-or-treating fun. Sweet! Any costume fun will be much more excellent, and sweeter, when you choose this costume for kids. Boys and girls alike will love wearing this simple costume, and if you get them the right shoes, they might even be ready to do a little strawberry dance. "What kind of dance is that?" you might ask. Well, it's part seedy, part leafy, and all awesome! Have them tap away or do sing a musical number, and they're sure to shine.